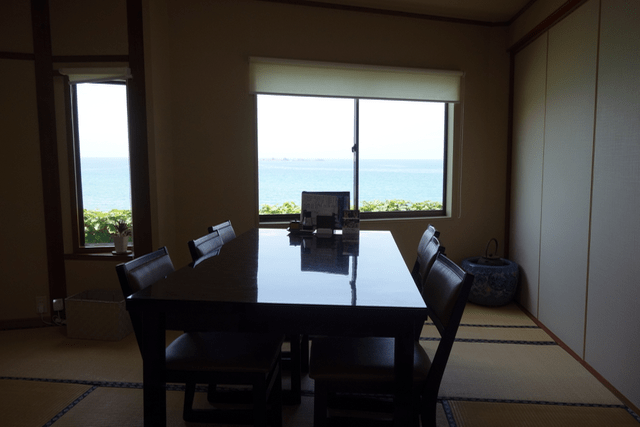 We are the guesthouse Kotonoha in attractive “Itoshima“, Fukuoka where 6 million people visit for a year. 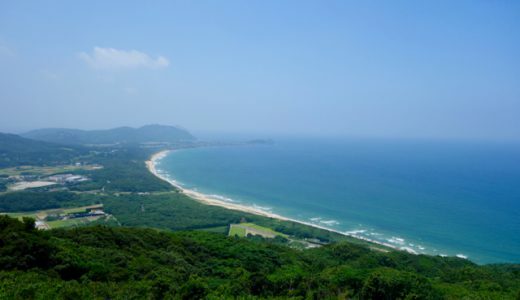 We recommend the cycling in Itoshima for sightseeing. 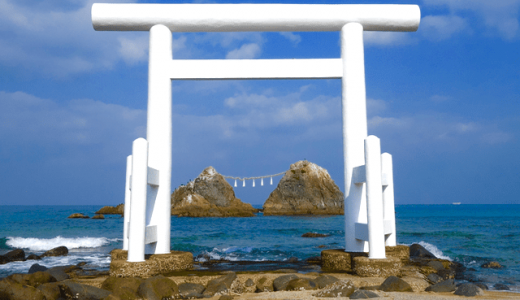 Because Itoshima is wider than you expected, traveling by car is easier to find, but it’s lilely to end up just by going over the spots and spots, so it may not be enough to feel the “ambience” of Itoshima. 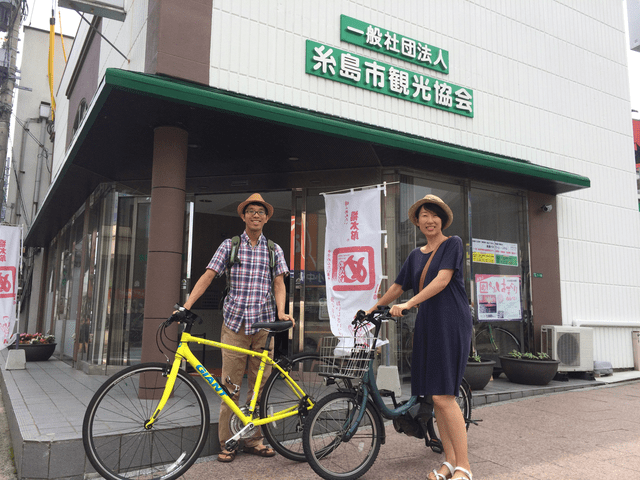 The easiest way is to rent a bicycle at the Itoshima tourism association in front of JR Chikuzen Maebaru! 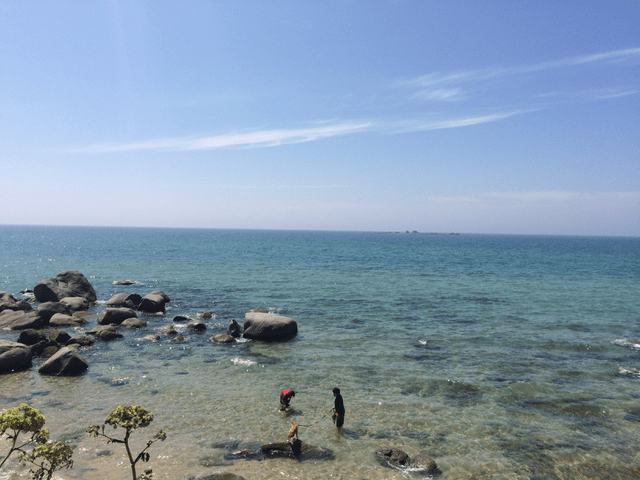 From Maebaru Station to the Nogita coast! 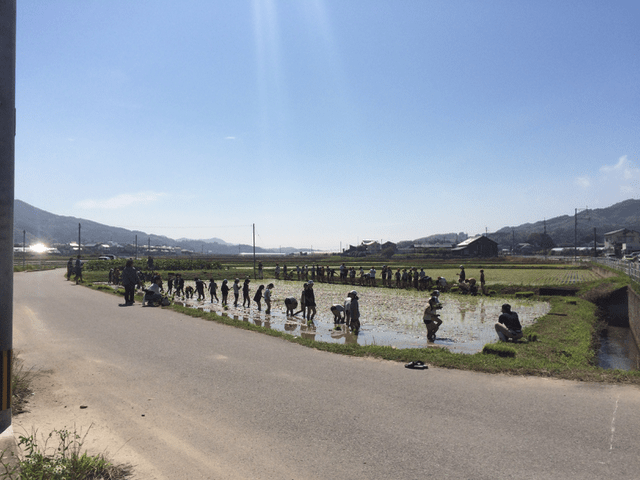 Go around Mt.Hiyama and then go back to Maebaru! First of all, let’s enter the building of the Tourism Association! 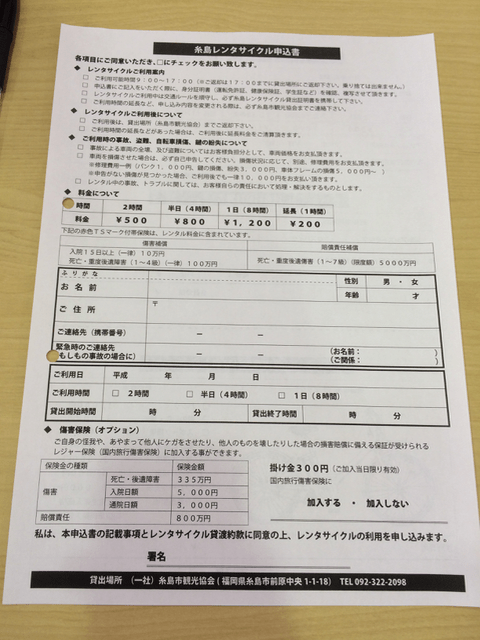 The rental time is 9:00-15:00, and you must return it to the tourist association by 17:00 on that day. 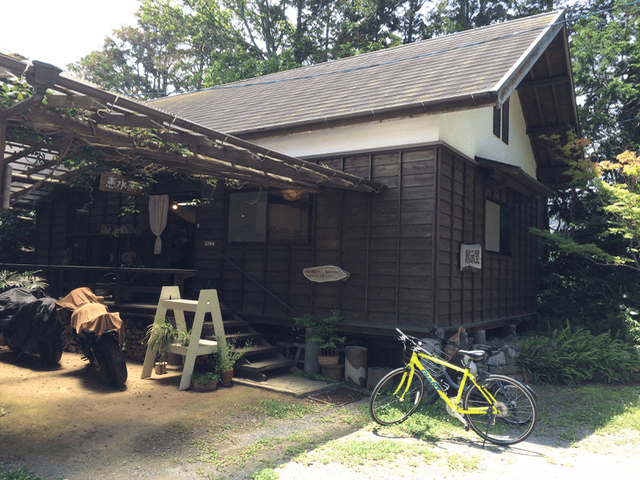 Here, you can rent an electric bicycle or a GIANT cross-bike. 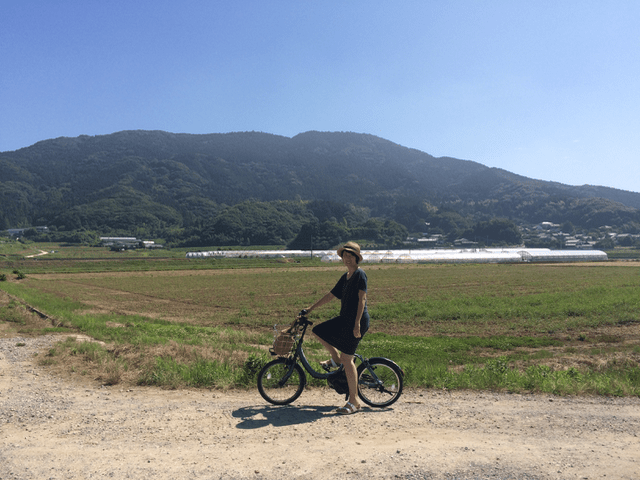 Electric bicycles has an advantage if you want to go up the hill or the mountain route. 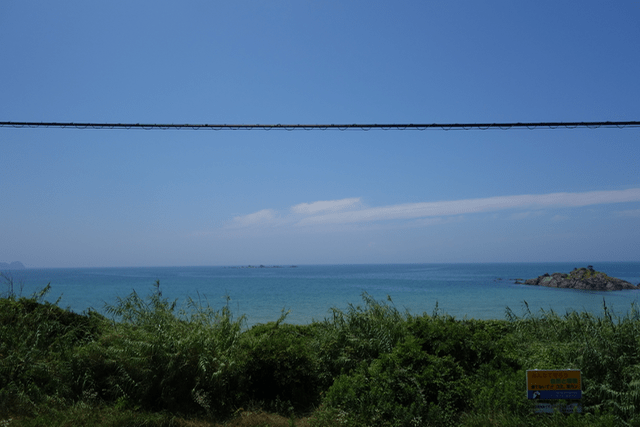 However, in Itoshima there are a lot of flat roads, if you want to go along the sea, cross-bike is good. Because it has the power of a big wheel. When you rent a cycle, please be careful about the points of note as follows. * You need an identification card (driver’s license, health Insurance card, passport, etc.) and a mobile phone or smartphone that can be contacted. * Parents consent is required under high school students. * Reservation is available only on weekdays. 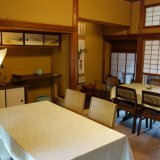 In addition, the extension fee is “200 yen per hour”. 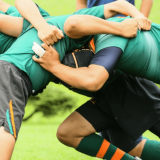 You will need to contact the Tourism association, when you want to extend the time. 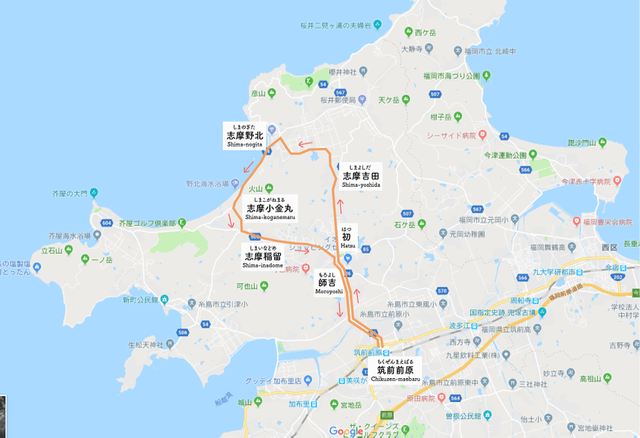 For your information, if you want to go along the sea in the Shima area, you need 40 minutes to an hour one way. At first, fill out the following application form and start. This time, we went to the following route. 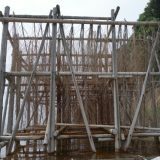 We will depart from the Tourism Association of JR Chikuzen-Maebaru, and aim at the northern seaside(Shima Nogita). 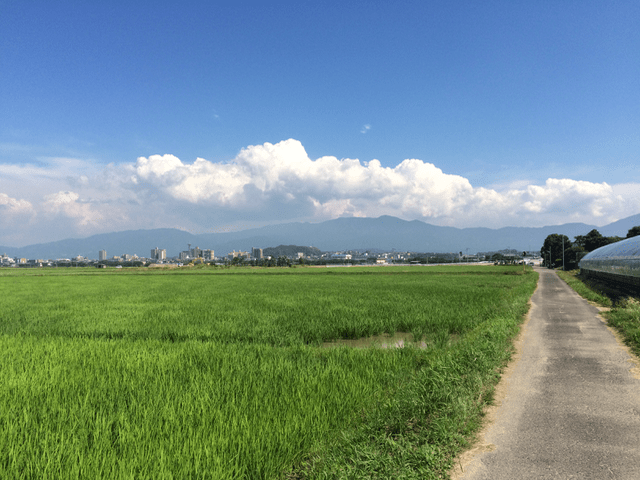 Then we move west and come back around the Mt.Hiyama. I think it is about 23 kilo meters in total. 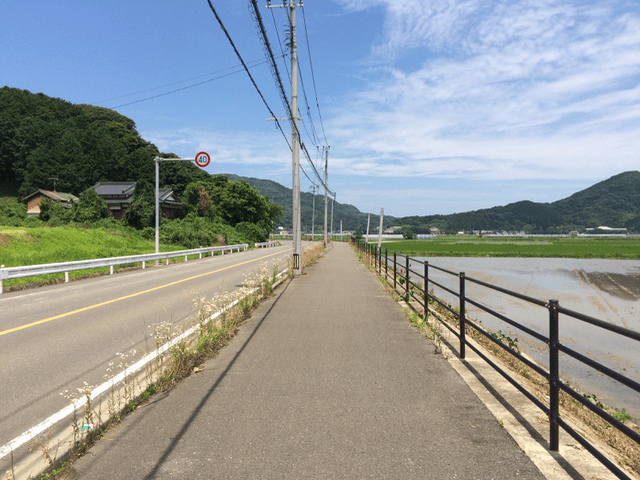 It is a very Itoshima-like route where the sea and the countryside spread. 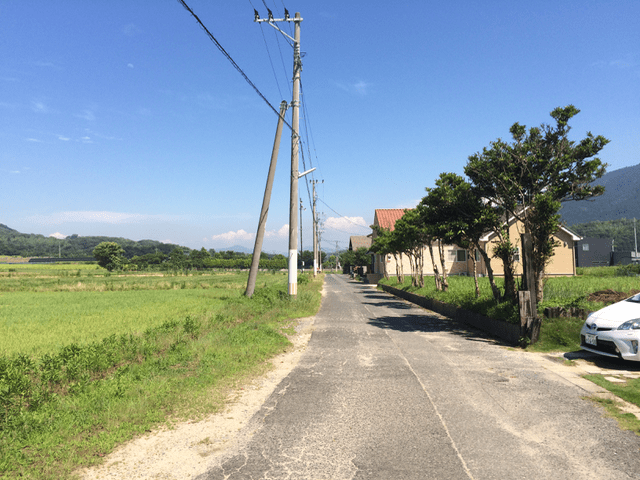 When you go to the north by bicycle, you will pass the new residential area called Shima Moroyoshi. If you drive a car, you never pass it. The charm of a bicycle is that you can freely go anywhere! 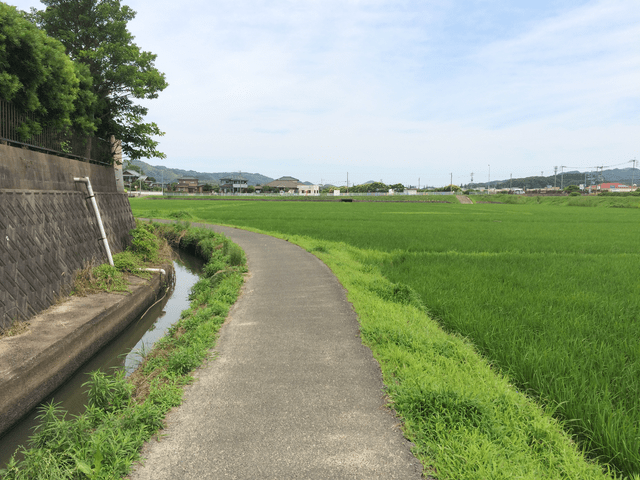 The cool breeze over the fields is pleasant. 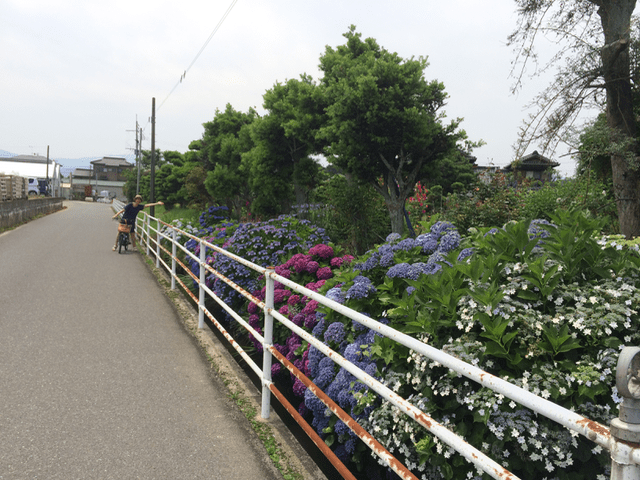 Hydrangeas are blooming by the waterway when advancing the side road. It is a fresh discovery. 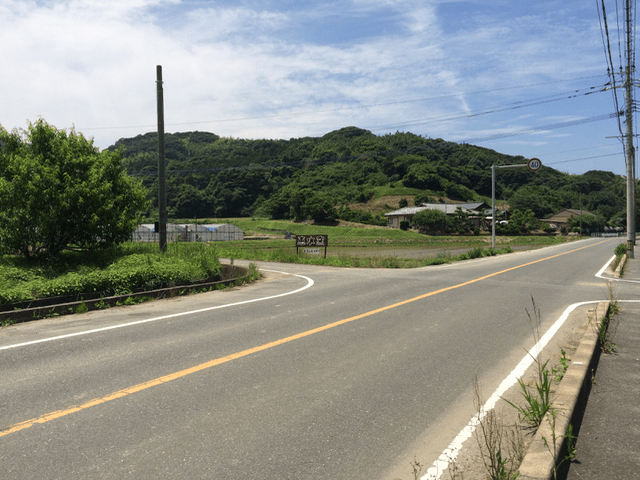 Now, the bicycle has passed “Moroyoshi” and came to “Hatsu”. 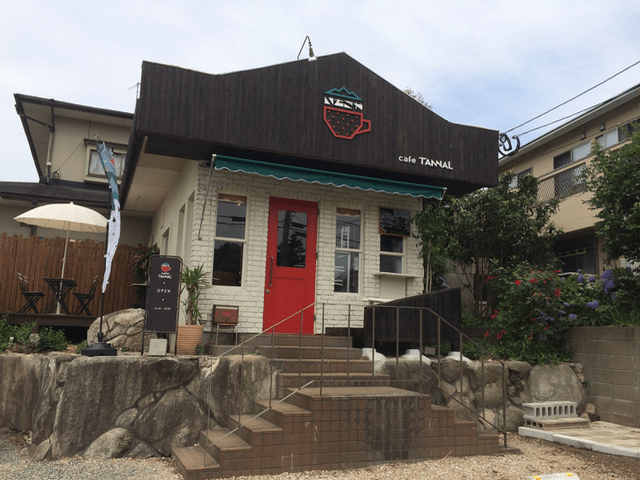 We passed through the side of cafe TANNEL and went ahead. 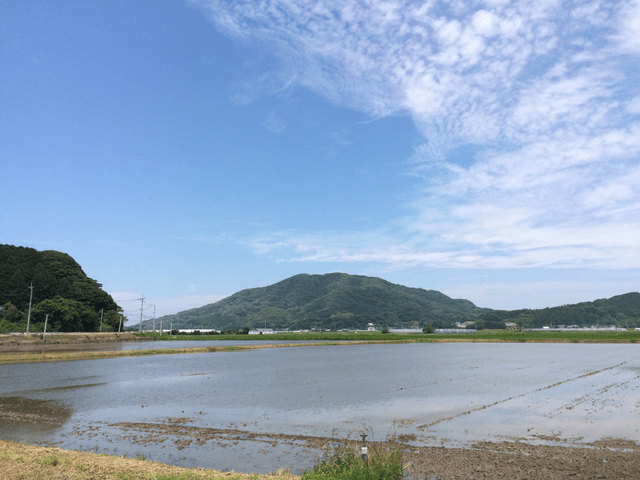 We can see Mt.Hiko in Shima-nogita behind the rice field. 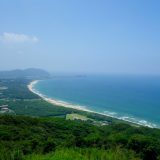 Itoshima has a strong image of the sea, but I understand that it is surrounded by the mountains. 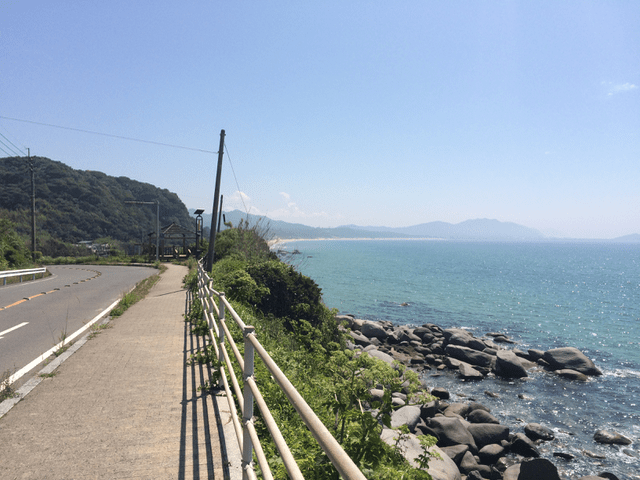 When I go by bicycle, I can tell that it is Itoshima that you can encounter the sea which pops up unexpectedly from such a gap of mountain. 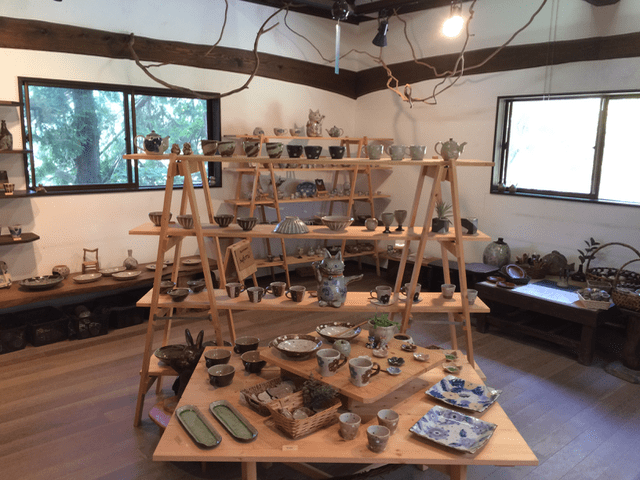 I did not know that there was a pottery with a splendid gallery in such a place. 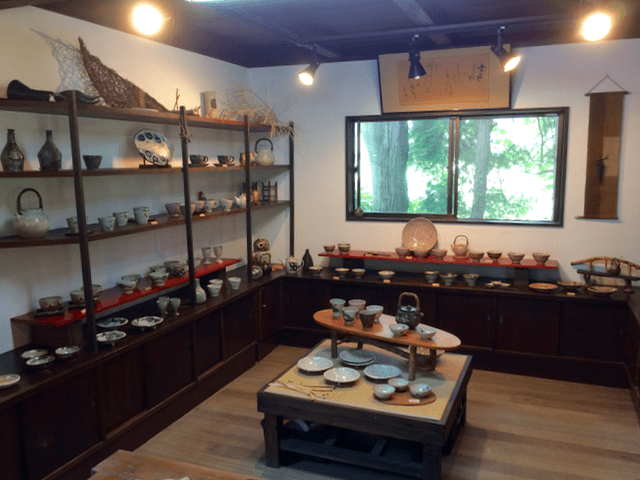 There are also works by other Itoshima artisans. 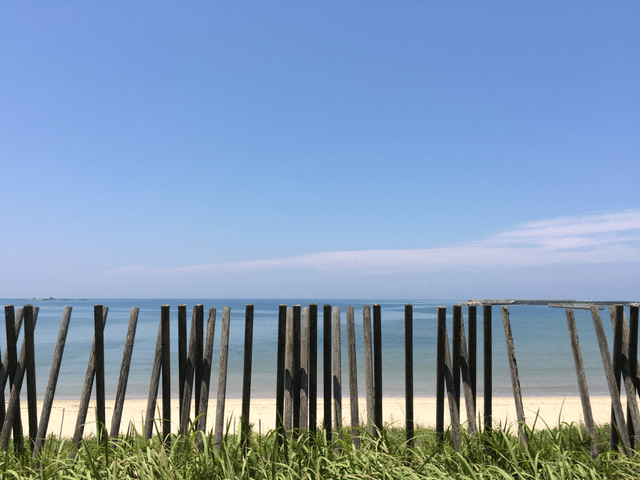 ↓ The Sea of Shima Nogita! I finally came to the sea! It took about one hour and thirty minutes since I just left the tourist association. We were hungry, so had lunch!! 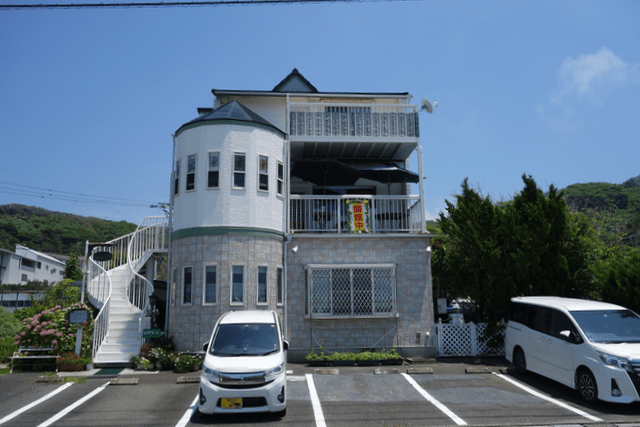 We went to the seafood restaurant Terasaki, which is along the sea. 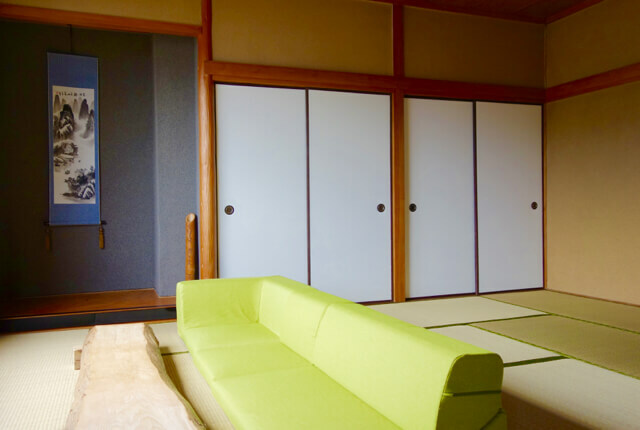 There is a large room and small rooms. You can see the sea from the both. 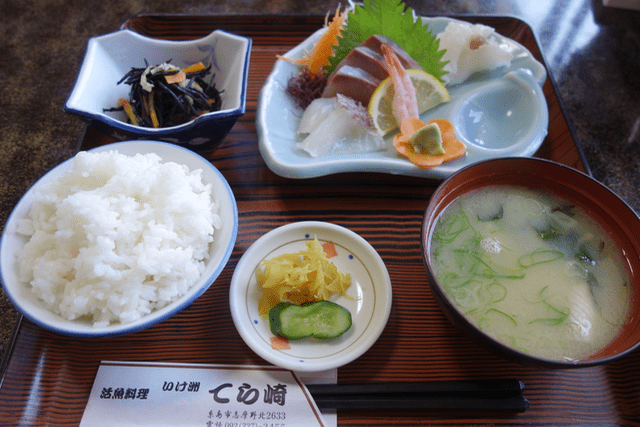 I wanted to eat sashimi in simple. There is also a gorgeous version of 2000 yen, but this 1000 yen is gorgeous enough. After eating lunch, we dropped in the cafe after all. 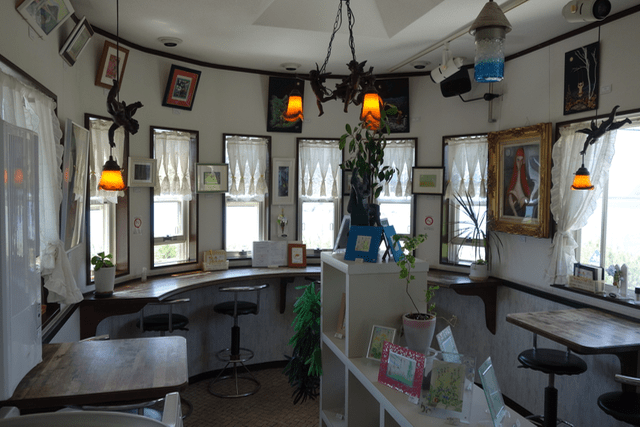 There are many cafes in the Nogita coast. And we dropped a cafe “White museum”. You can enjoy the real coffee of flannel drip. 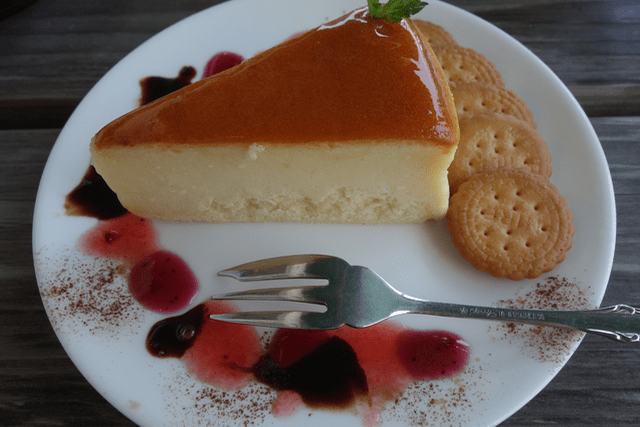 The coffee is 670 to 700 yen, and the cake set is 1020 yen, so the cake set is reasonable! We ordered a cake set. The location is very good. This is a special coffe roasted with a stone kiln. The coffee of flannel drip was mellow and was delicious. 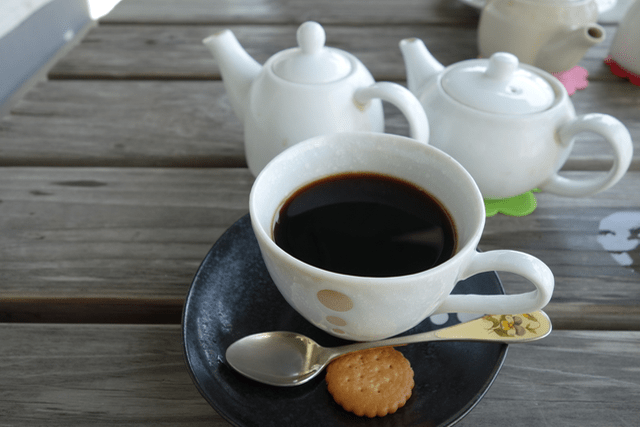 There are two pots, refills and drip (for thinner). 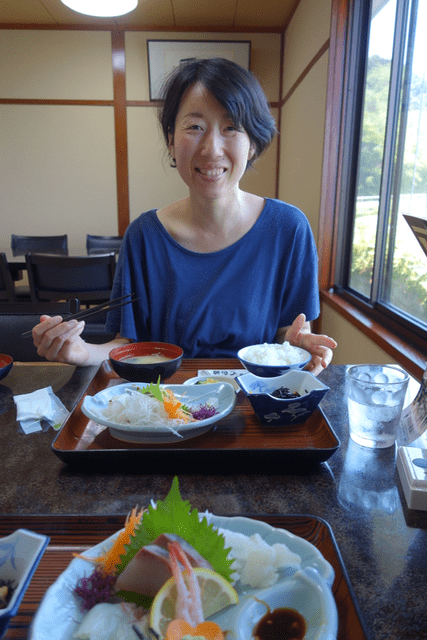 After a cup of coffee, we return to Maebaru over Mt.Hiyama. We ride by bicycle along the sea for a while. ↓ We feel good at the sea of Nogita. A dog enters the sea and it seems to be happy. The water of the sea is also quite transparent. 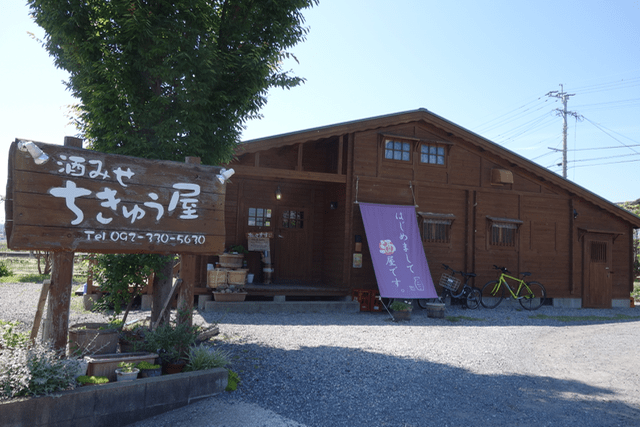 Yakamashi village is a fashionable village with some workshops and a cafe. 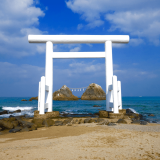 It is in Shima Koganemaru. Yakamashi means “noisy.” Because many residents like DIY. So on weekend, they enjoy DIY. 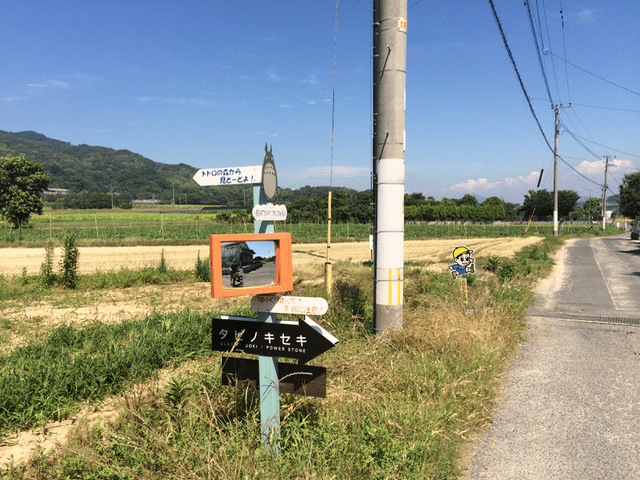 So it is Yakamashi village. 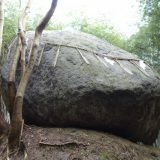 There are some workshops in yakamashi village, so it would be nice to stop by if you have time. Signs are made by residents. 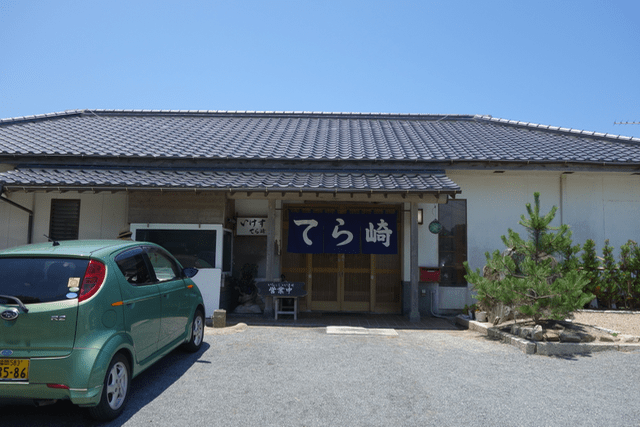 After visiting Yakamashi village, there is a “Chikyuya” which sells sake. 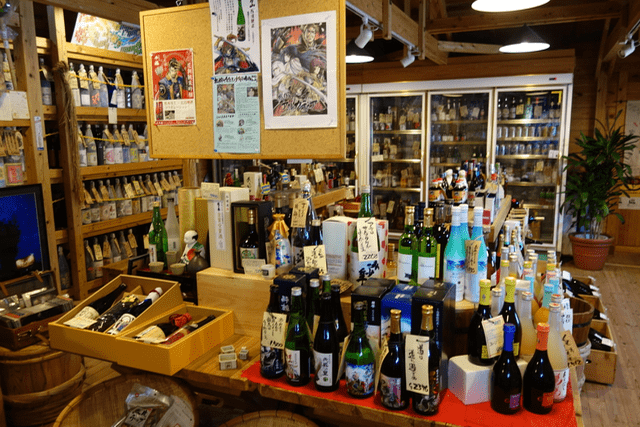 They have anything from sake, shochu, wine to unique alcohols. 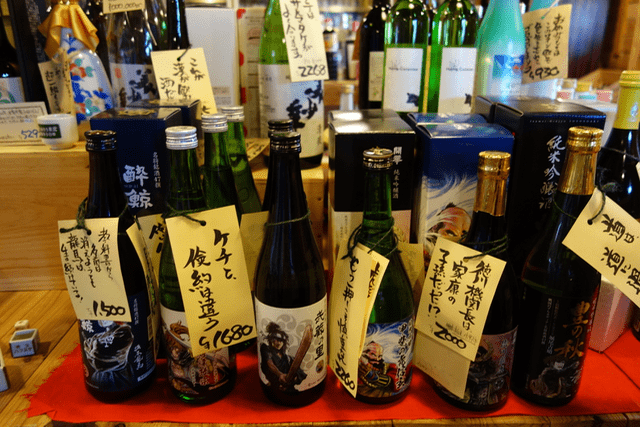 The Chikyuya gives you the proper advice on which liquor is good, depending on your tastes and your purpose. 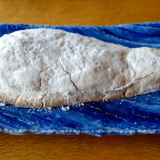 If you are considering a gift, we recommend that you come to the Chikyuya. Mt.Kaya seen from Shima Inadome. It is a point of the bicycle to run slowly on such a gravel road not only a paved road. 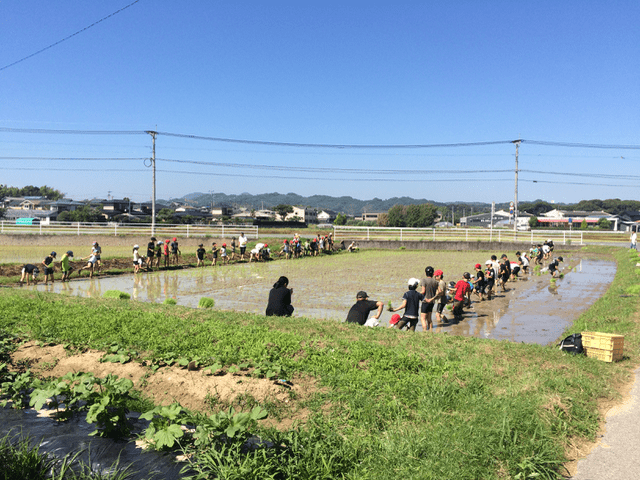 It is still tradition to plant the rice with all the mud in each row though it came to do at a dash by the machine now. When I was in elementary school, I remembered that I did it at school. I think this is a very good experience that people can never do in a city school. It was a wonderful sight that I met by chance. 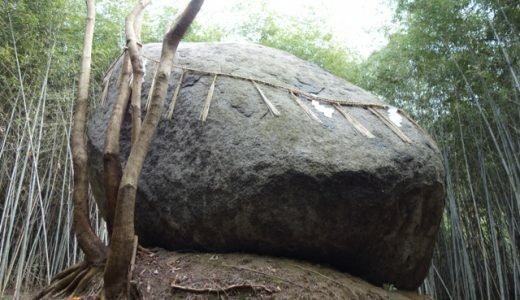 Sefuri mountain system is 1000m class extends beyond the city area of Maebaru. There was such a place. It was interesting. I extended the cycling time for 1 hour and ended a total of 5 hours. 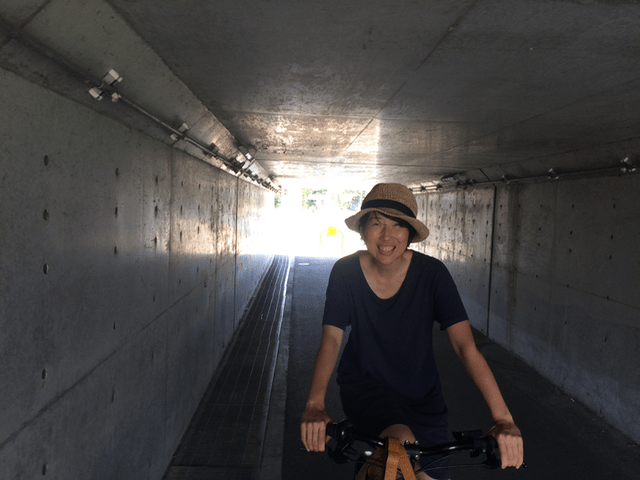 When I was riding a cross bike, I was comfortable and was not tired at all. We recommend the rental bike. 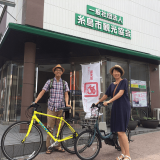 We plan a bike tour for overseas tourists in the near future, so it was really helpful to go around Itoshima by bicycle. I would like to develop a variety of routes. We will enjoy Itoshima tomorrow!! 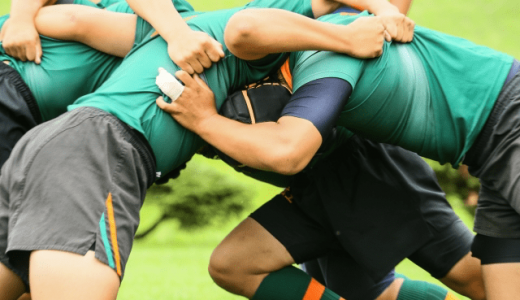 To watch Rugby World Cup 2019, let's go to Itoshima, Fukuoka!